Dead Naked Hippies are thrashing, screaming, art-rock outsiders. 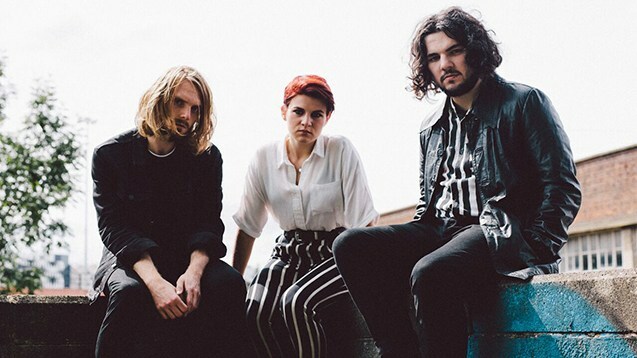 The trio, fronted by force-of-nature front woman Lucy Jowett, will lull you in with subtlety before unleashing their take-your-head-off wall of sound. They were included in BBC’s Sound Of 2018 playlist and have received love from DIY, BBC 6Music, The Independent, KCRW, Dork, Clash, Metro, PRS Magazine and Help Musicians UK. The band aren’t afraid to tackle confrontational topics honestly, speaking about self-love, mental health, gender and many other things in an open and engaging way, both in their music and interviews. Despite consisting of only three members, they are a force to be reckoned with live with booming drums, huge guitars and Jowett’s banshee-like approach hitting hard. They have shared stages with the likes of Dream Wife, IDLES and Queen Zee as well as playing Leeds Festival, 2Q Festival, Twisterella, Live at Leeds, Stockton Calling and more.